If you’re going Car-Free, Car-Light, or just want to start riding a bike once a week to work, or for fun and fitness. The Tesla is a great choice to get you started. Tektro Hydraulic Disc brakes maximize your stopping power no matter the weather or road conditions. Large volume tires help smooth out rougher bike lanes, and help guard against flats. The Tesla alloy frame is ready to bolt on fenders for all weather riding and racks to carry your gear or hook up some panniers. Great features at a great price ! A great daily commuter errand runner or fitness machine. Simple maintenance, easy to ride, superb comfort and control. 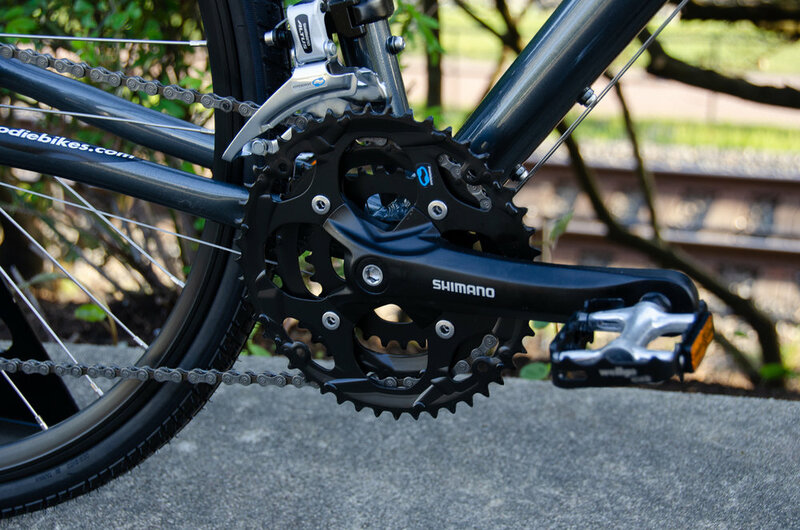 The ultra reliable and durable Shimano 3 X 8 Drivetrain gives you a huge range of gearing to get you up any hill, to go as fast as you want, or as casual as you want.